Easter is an annual festivity that calls for family gatherings and the consumption of great amounts of delicious food. It wouldn’t be Easter without chocolate eggs, hot cross buns, fish on Good Friday and a Sunday roast lamb. But where do these traditions come from and how have they changed over time? Within our Wentworth Falls Country Club blog this month we will have a look at the history and symbolism of some of our most common Easter dishes and also describe a simple yet delicious recipe for hot cross buns! Much has been written about the symbolism and traditions of Easter foods. It is interesting to note that the historical interpretations of Easter fall under three categories. These are the religious symbolism, the pagan rites and the modern interpretation and evolutions. The modern take with egg hunts for the children (and adults! ), delicious seafood dinners on Friday and an abundance of hot cross buns is by far our favourite. According to the Oxford Companion to food, Easter foods are primarily those of Easter Sunday, the day on which Jesus rose from the dead, a day of special rejoicing for Christians, who rejoice too at reaching the end of the long Lenten fast. The concept of renewal and rebirth is responsible for the important role played by the egg in Easter celebrations, a role which no doubt antedates Christianity. There are also special foods associated with the other days in the Easter calendar. In Europe, there is a general tradition, not confined to Christians, that Easter is the time to start eating the season’s new lamb, which is just coming onto the market then. Easter breads, cakes, and biscuits are a major category of Easter foods, perhaps especially noticeable in the predominantly Roman Catholic countries of south and central Europe. Traditional breads are laden with symbolism in their shapes, which may make reference to Christian faith.In England breads or cakes flavoured with bitter tansy juice used to be popular Easter foods. 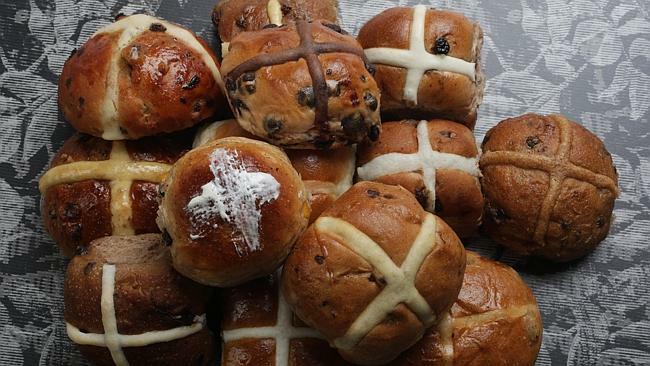 The most popular English Easter bread and now also Australian is the hot cross bun. Eggs are traditionally connected with rebirth, rejuvenation and immortality. This is why they are often associated with Easter. Eggs were colored, blessed, exchanged and eaten as part of the rites of spring long before Christian times. Even the earliest civilizations held springtime festivals to welcome the sun’s rising from its long winter sleep. They thought of the sun’s return from darkness as an annual miracle and regarded the egg as a natural wonder and a proof of the renewal of life. As Christianity spread, the egg was adopted as a symbol of Christ’s Resurrection from the tomb. For centuries, eggs were among the foods forbidden by the church during Lent, so it was a special treat to have them again at Easter. In Slavic countries, baskets of food including eggs are traditionally taken to church to be blessed on Holy Saturday or before the Easter midnight Mass, then taken home for a part of Easter breakfast. People in central European countries have a long tradition of elaborately decorated Easter eggs. 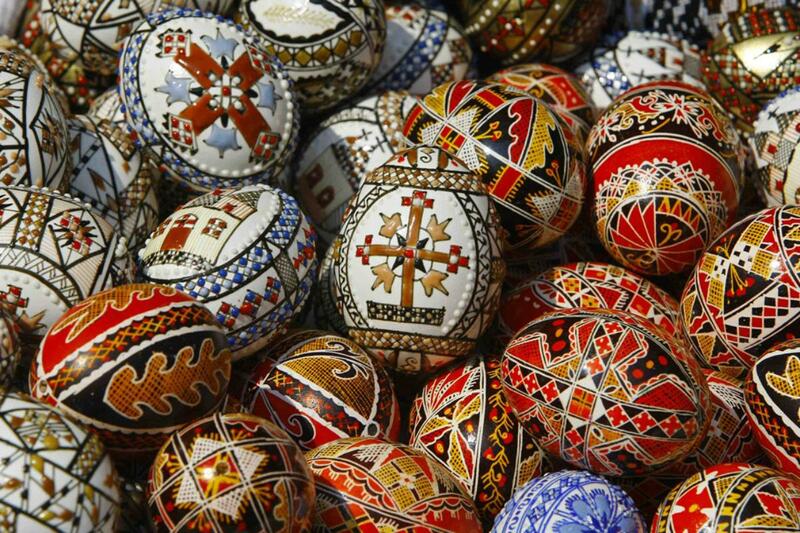 Polish, Slavic and Ukrainian people create amazingly intricate designs on the eggs. They draw lines with a wax pencil or stylus, dip the egg in color and repeat the process many times to make true works of art. Every dot and line in the pattern has a meaning. Yugoslavian Easter eggs bear the initials “XV” for “Christ is Risen,” a traditional Easter greeting. The Russians, during the reign of the tsars, celebrated Easter much more elaborately than Christmas, with Easter breads and other special foods and quantities of decorated eggs given as gifts. The Russian royal family carried the custom to great lengths, giving exquisitely detailed jeweled eggs made by goldsmith Carl Faberge from the 1880’s until 1917. This custom is found not only in the Latin but also in the Oriental Churches. The symbolic meaning of a new creation of mankind by Jesus risen from the dead was probably an invention of later times. The custom may have its origin in paganism, for a great many pagan customs, celebrating the return of spring, gravitated to Easter. The egg is the emblem of the germinating life of early spring. Easter eggs, the children are told, come from Rome with the bells which on Thursday go to Rome and return Saturday morning. Good Friday commemorates the crucifixion of Jesus Christ following his time in the desert and his triumphal re-entrance into Jerusalem. This is a very important event in many Christian churches and is seen by some as the foundation of the Religion. Many churches hold special services on Good Friday to remind their congregations about Christ’s suffering. Good Friday falls on the Friday before the first Sunday after the first full moon on or after the vernal equinox. It can seem strange that a day of death and suffering is known as ‘Good’ Friday. There are a number of theories as to why the day marking the crucifixion of Jesus is known in this way. The word ‘Good’ may be a different spelling or rendering of ‘God’ or it may have another, now lost, meaning of ‘holy’. Another theory is that the tragedy of the crucifixion of Jesus brought great ‘good’ to his followers. 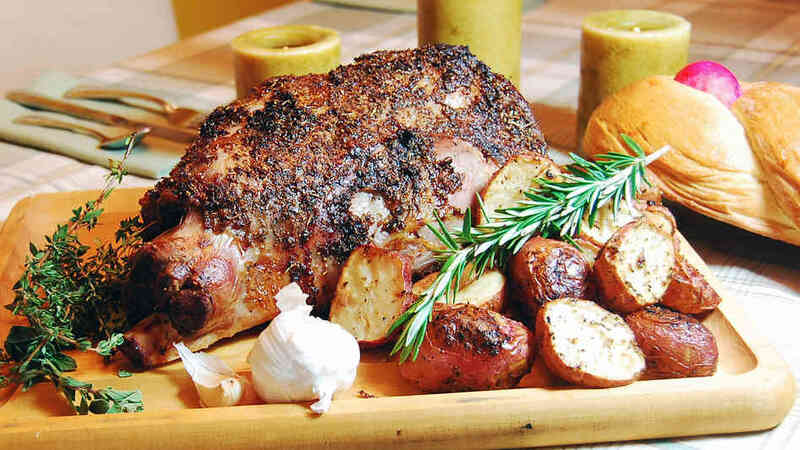 The roast lamb dinner that many eat on Easter Sunday goes back earlier than Easter to the first Passover of the Jewish people. The sacrificial lamb was roasted and eaten, together with unleavened bread and bitter herbs in hopes that the angel of God would pass over their homes and bring no harm. As Hebrews converted to Christianity, they naturally brought along their traditions with them. The Christians often refer to Jesus as The Lamb of God. Thus, the traditions merged. Hot cross buns are an Easter favorite in many areas. The tradition allegedly is derived from ancient Anglo-Saxons who baked small wheat cakes in honor of the springtime goddess, Eostre. After converting to Christianity, the church substituted the cakes with sweetbreads blessed by the church. According to Holiday Symbols and Customs the pagans worshipped the goddess Eostre (after whom Easter was named) by serving tiny cakes, often decorated with a cross, at their annual spring festival. When archaeolgists excavated the ancient city of Herculaneum in southwestern Italy, which had been buried under volcanic ask and lava since 79 B.C., they found two small loaves, each with a cross on it, among the ruins. The English word “bun” probably came from the Greek boun, which referred to a ceremonial cake of circular or crescent shape, made of flour and honey and offered to the gods. Superstitions regarding bread that was baked on Good Friday date back to a very early period. In England particulary, people believed that bread baked on this day could be hardened in the oven and kept all year to protect the house from fire. Sailors took leaves of it on their voyages to prevent shipwreck, and a Good Friday loaf was often buried in a heap of corn to protect it from rats, mice, and weevils. Finely grated and mixes with water, it was sometimes used as a medicine. In England nowadays, hot cross buns are served at breakfast on Good Friday morning. They are small, usually spiced buns whose sugary surface is marked with a cross. In the English Bread and Yeast Cookery book, hot cross buns first became popular in Tudor days, at the same period as the larger spice loaves or cakes, and were no doubt usually made form the same batch of spiced and butter-enriched fruit dough. For a long time bakers were permitted to offer these breads and buns for sale only on special occasions, as is shown by the 1592 decree, under Elizabeth I, whereby ‘no bakers at any time or times hereafter make, utter, or sell by retail, within or without their houses, unto any of the Queen’s subject any spice cakes, buns, biscuits, or other spice bread (being bread out of size and not by law allowed) except it be at burials, or on Friday before Easter, or at Christmas, upon pain or forfeiture of all such spiced bread to the poor’. If anybody wanted spice bread and buns for a private celebration, then, these delicacies had to be made at home. In the time of James I, further attempts to prevent bakers from making spice breads and buns proved impossible to enforce, and in this matter the bakers were allowed their way. Although for difference reasons, the situation now is much as it was in the late seventeenth century, spice buns appearing only at Easter. Mix two pounds of flour with a small tea-spoonful of powdered spice and half a tea-spoonful of salt. Rub in half a pound of good butter. Make a hollow in the flour, and pour in a wine-glassful of yeast and half a pint of warmed milk slightly coloured with saffron. Mix the surrounding flour with the milk and yeast to a thin batter; throw a little dry flour over, and set the pan before the fire with the milk and yeast to a thin batter; throw a little dry flour over, and set the pan before the fire to rise. When risen, work in a little sugar, one egg, half a pound of currants, and milk to make a soft dough. Cover over as before, and let it stand half an hour. Then make the dough into buns, and mark them with the back of a knife. Time, fifteen to twenty-minutes to bake. Sufficient for twenty-four buns. We would love to hear from you as to what your culinary traditions over the Easter holidays are. Please comment below on the Wentworth Falls Country Club blog. We hope you have a wonderful Easter holiday season. Categories: Easter Culinary Traditions, Uncategorized | Permalink.